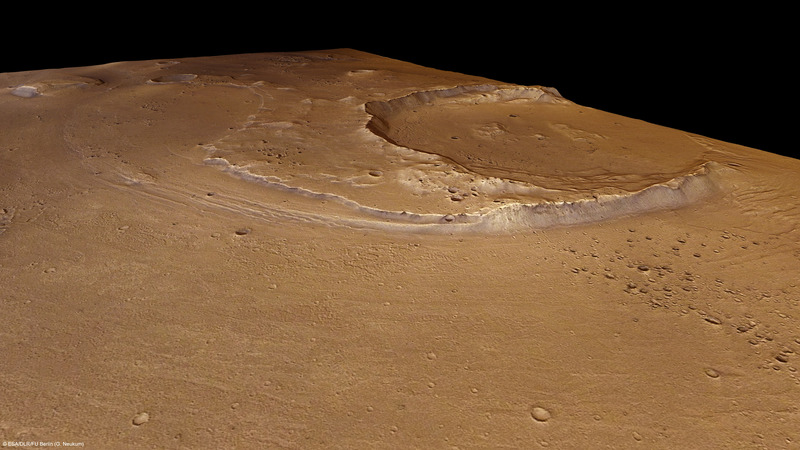 The Ares Vallis outflow channel meanders for more than 1700 kilometres across the southern highlands of Mars and ends in a 100-kilometre-wide delta-like region in the lowlands of Chryse Planitia. 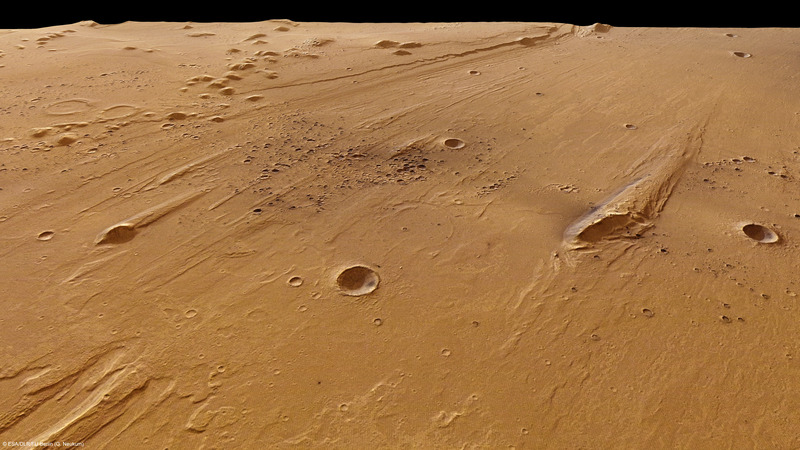 On 11 May 2011, parts of the Ares Vallis channel were photographed using the High Resolution Stereo Camera (HRSC) operated by the German Aerospace Center (Deutsches Zentrum für Luft- und Raumfahrt; DLR) on board ESA's Mars Express spacecraft during orbit 9393. 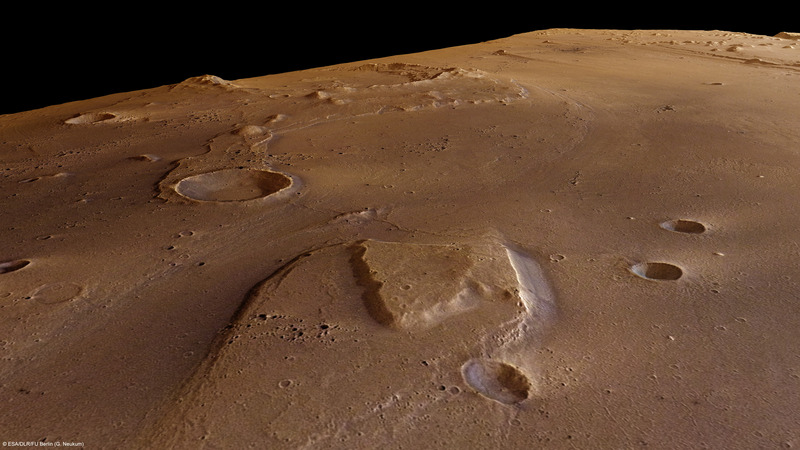 The images show a large, partially eroded crater, streamlined 'islands' and terrace-like 'river banks' on the valley walls; all signs of erosion by the water that, in the period of Mars' early formation, would have flowed through Ares Vallis. The photographs, acquired from an altitude of 300 kilometres, show a section of the Ares Vallis channel located at 16° north and 327° east. The image resolution is about 15 metres per pixel. The valley was named after Ares, the Greek god of war, whose counterpart among the Roman deities was Mars. 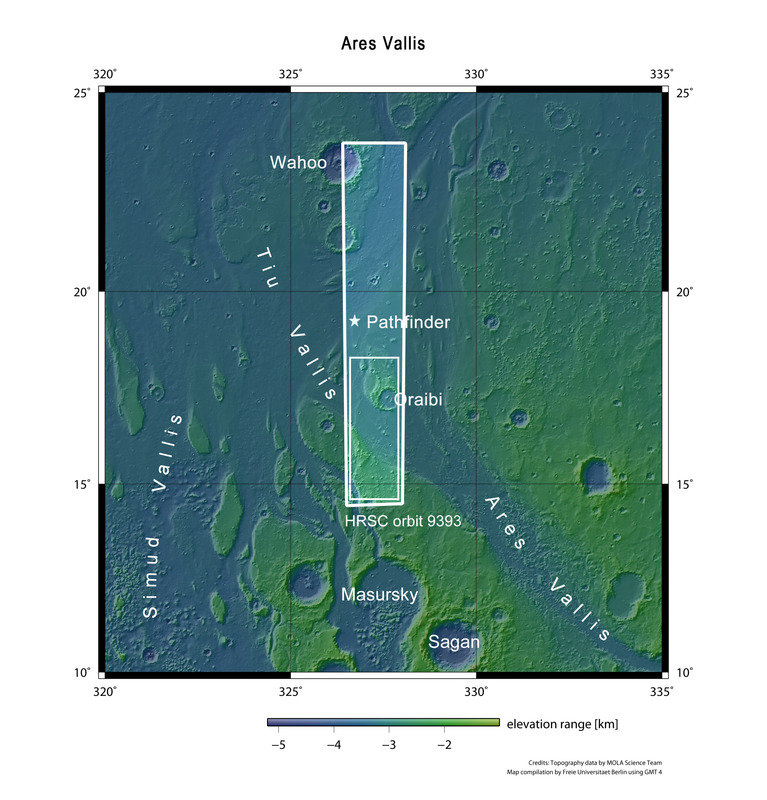 The Ares Vallis outflow channel was discovered in 1976 in images acquired by the US Viking spacecraft. In 1997, the small Mars Pathfinder rover landed in the Ares Vallis channel to investigate the signs of water flow. The most distinctive landscape characteristic is the large impact crater Oraibi, about 32 kilometres across. The crater lies just 100 kilometres south of where Pathfinder landed (see context map) on 4 July 1997; it explored the area for 12 weeks. The signs of erosion are easily spotted on the Oraibi crater. The landscape formation shows that the crater was heavily engulfed; the force of the water was so strong that the southern rim of the crater was breached and the interior of the crater flooded and filled with sediment (frame 1 in the feature map; north is towards the right). It seems that water would have once flowed through the valley with considerable force and managed to erode large quantities of material. As a result, the 'river banks' have a stepped, terrace-like morphology (frame 2 in the feature map). Parallel ridges and troughs running in the direction of flow also suggest powerful erosion. Other patterns of erosion on the valley floor can be identified by means of the streamlined islands (frame 3 in the feature map); these indicate the former direction of flow. Just as revealing are the 'ghost craters' - the outlines of which can just be made out. They are found both in the valley itself and on the plateau (left half of the feature map). This suggests that some areas of the plateau, which rises to about 1000 metres above Ares Vallis, were also at least partially flooded. On the plateau, many isolated buttes, or monadnocks, are visible (frame 4 in the feature map). They appear to be remnants of an earlier continuous coverage that has mostly been eroded. On the left edge of the image, part of an ejecta blanket from a large impact can also be seen on the plateau. On the top left edge of the image (frame 5 in the feature map) we see an interesting detail - a landslide. It is about four kilometres wide and could have resulted from the impact of the asteroid whose crater ejecta blanket is shown in frame 4. Some of the individual rays of these ejecta can be followed to the landslide. Also characteristic of this region are the unusually dense clusters of impact craters (frame 3 in the feature map) that are either arranged in clusters or in a directed pattern. Two processes can be responsible for forming crater groups like this. Some crater groups develop when an asteroid penetrates the atmosphere and breaks into numerous small pieces of debris, which then individually impact the surface. Other crater groups are characteristic of secondary craters; that is, many pieces of rock are thrown up by the impact of an asteroid - these then fall back to the surface over a distance of several kilometres and form smaller craters. The colour image was generated from data acquired by the HRSC nadir channel and colour channels; the oblique perspective images were generated from HRSC stereo channel data. The anaglyph image, which conveys a 3D impression of the landscape when seen through red/blue or red/green glasses, was derived from data acquired with the nadir channel and one of the stereo channels. The black-and-white detail image was acquired using the nadir channel, which captures image data at the highest resolution of all the channels. The High Resolution Stereo Camera, HRSC, on the European Space Agency's Mars Express mission is led by the Principal Investigator (PI) Prof. Dr Gerhard Neukum, who was also responsible for the technical design of the camera. The science team of the experiment consists of 40 co-investigators from 33 institutions and 10 nations. The camera was developed at DLR under the leadership of the PI and it was built in cooperation with industrial partners EADS Astrium, Lewicki Microelectronic GmbH and Jena Optronik GmbH. 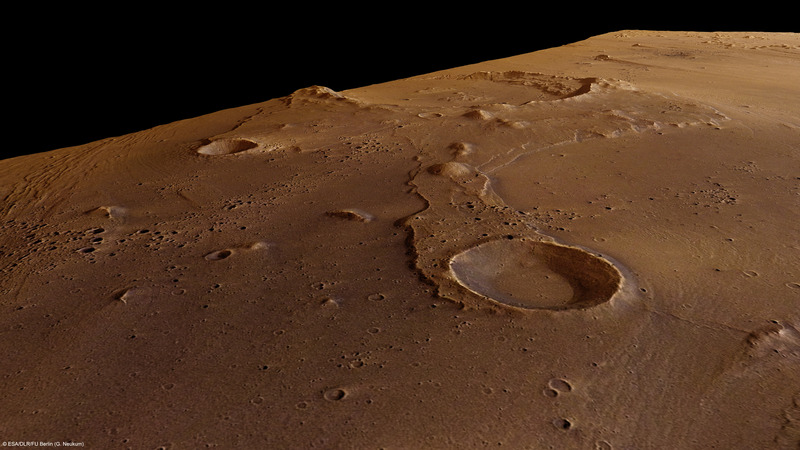 The instrument on Mars Express is operated by the DLR Institute of Planetary Research, through ESA/ESOC. The systematic processing of the HRSC image data is carried out at DLR. The scenes shown here were processed by the PI-group at the Institute for Geosciences of the Freie Universität Berlin.